As an extension of the Travel category in my video portfolio at editingluke.com, I recently created a brand new map page where by clicking on the stars you can watch an associated edit with that location. I actually created a DVD several years ago with this layout, which actually kicked off my focus on cutting together brand new postcard edits. With the flexibility of my new site, I thought this would be another great interactive way of getting people to check out my projects. Edits range from Vegas to Alaska to Mount Rushmore to Ottawa and Disneyland. This new addition also comes on the verge of my long awaited Indio Outio edits to debut - more on that soon. For now, click on over to the Editing Luke portfolio and check out the Travel section by following the portfolio link. A view of every page on the new site can also be seen simply by clicking the 'Site Overview' tab on the homepage. 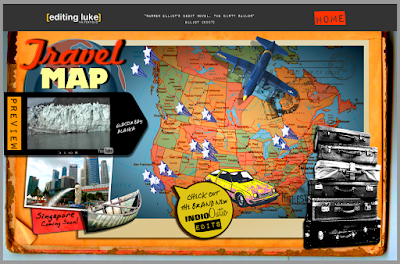 Nice job on this map page, Luke! As with everything on your new site the design on this page is no exception and I look forward to seeing that map added to more and more in the future. And a quick note on your new site as well, I'm very impressed with the amount of work and rework you seem to be putting into it. Every time I visit it seems to have a new and better design. Keep it up!